Professional Jewelry Cleaner This amazing cleaner contains 100% biodegradable cleaning agents plus banana and coconut oil. It cleans the cleanest clean and rinses film free; that is why it brings out 100% more sparkle, color and brilliance to your diamonds, cubic zirconias, crystals, rhinestones, and all stones; opals radiate more fire; and pearls impart more luster. It is mild enough for pearls, yet powerful enough to bring back that "brand new look" to all your jewelry. All of your metals will shine, but it will not remove antiquing or oxidizing. It removes undesirable paint from jewelry and eyeglasses. When the cleaner appears unsightly run it through a coffee filter; it doesn't lose strength. Mix half cleaner with half water in a spray bottle for items that can't be immersed such as crystal chandeliers, glued pieces, and rhinestones; just spray and wipe dry. Coin collectors: Use this to clean your coins; it won't strip them of their value. Use our polishing cream to remove tarnish from your coins. Biodegradable Tarnish Remover Our polish works great on metals, silver, gold, brass, bronze, copper, chrome, stainless steel, and aluminum. It cleans marble and takes ink marks off of surfaces safely...even permanent ink! It takes tar off of cars and is scientifically formulated for cleaning, polishing and maintaining all metals the safe and easy way. 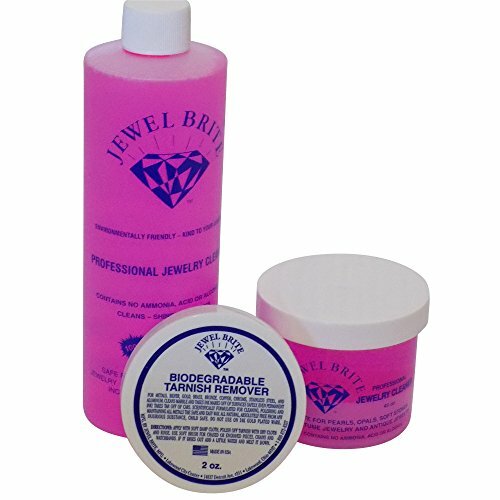 Jewel Brite polish is all natural and absolutely free from any injurious substance. It's also absolutely child safe. Clearview Anti-static, Anti-fog spray Excellent for eyeglasses, frames and lenses, CD-ROM media, computer and TV screens. Ideal for travel, auto or RV use. For use on glass or plastic. Polishing Cloth EFor gold, silver, brass, copper, bronze or any precious metal. Slightly abrasive to remove hairline scratches. Excellent for travel. biodegradable banana and coconut oil. Anti-static, Anti-fog spray Excellent for eyeglasses, frames and lenses, CD-ROM media, computer and TV screens. If you have any questions about this product by Jewel Brite, contact us by completing and submitting the form below. If you are looking for a specif part number, please include it with your message.